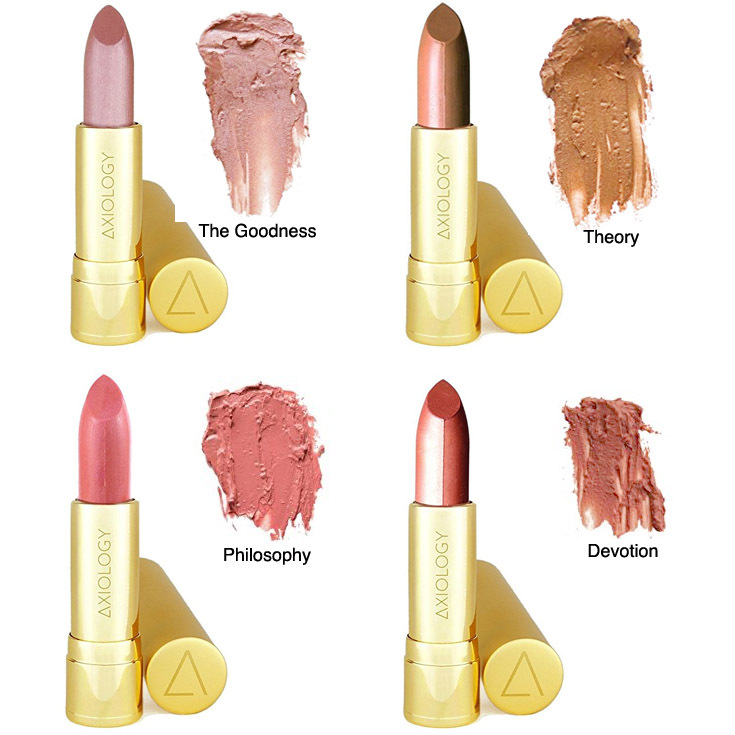 We can’t get enough of these creamy, pigmented lippies from Axiology! Each lipstick strikes the perfect balance between ultra-hydrating and a pop of color, making them a necessity for everyday use. One swipe on your pout and you’ll understand why we’re going gaga over these beauties! The formula is luxurious, hydrating and nourishing, made with pure organic ingredients like avocado butter and coconut oil. If you’re ready to make the switch to natural cosmetics, this cruelty free, vegan and non-toxic formula is about to become your new BFF. Here’s the lowdown on 4 of our favorite must have shades for everyday, or you can go straight to the details here! This buttery soft pink gives a light wash of color to make your lips appear fuller. A great everyday neutral, The Goodness gives a healthy glow and provides a moisturizing creme finish. If you love 90s style lipsticks, you’ll adore this soft, brown. Theory is a rich caramel color that dries to a semi-matte finish. You could compare this shade to MAC’s Velvet Teddy or Kat Von Dee’s Bow and Arrow, except Theory is more hydrating and, of course, vegan, natural and cruelty free! More pigmented than The Goodness, this ultra-smooth creme finish lipstick is a floral inspired pink tone. Philosophy looks gorgeous on all skin tones and offers all day moisturizing benefits. Devotion offers the perfect balance between a rosy pink and a warm brown. Many people have said its a “my lips but better” color that enhances and fills out the lips for a naturally pretty pout.